It's nice to have lots of fun hair accessories to play with, but building a collection can cost a pretty penny. Don't let a tight budget squash your creativity. There are many ways to use clips, bobby pins and even photographs to make a hairstyle stand out. 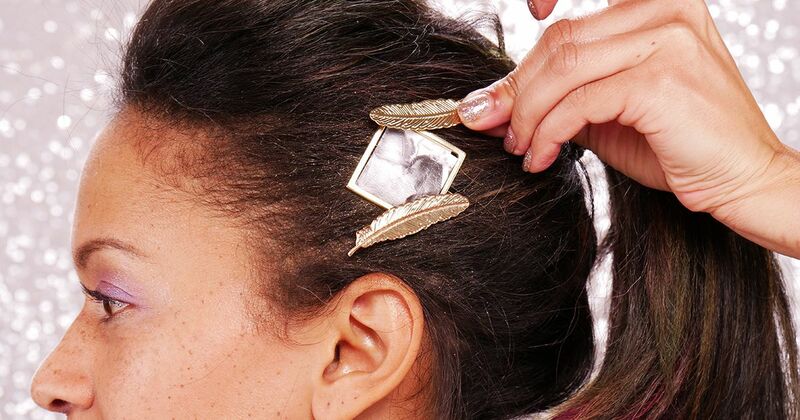 Show off your love of family and friends by adding a few photographs to your updo. A small square hair clip looks just like a picture frame and can be modified to hold a sweet selfie. With a little ingenuity, you can also use bobby pins and spin pins to hold lightweight photos in place, too. There's no right or wrong when it comes to being fashionable, so follow your muse. 1. Secure your hair in a ponytail on top of your head with a hair elastic. 2. Dip the fluffy brush into the hair glitter, and then brush the glitter onto the hair where you want to insert the hair clip. 3. Insert a small photograph into the square hair clip. Then secure the clip on the side of your head near your ear. 4. Clip two leaf-shaped hair clips near the corners of the square pin. 5. On the other side of your head, use a bobby pin to secure another photo to your hair. 6. To hold the photo in place, insert a spin pin at each lower corner and another one on the top of the photo in the middle. 7. Wrap the hair in the ponytail up on top of your head in a bun, and secure it with more bobby pins and a few decorative spin pins. Enjoy your new, pretty look!